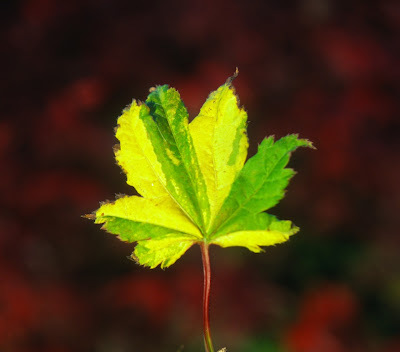 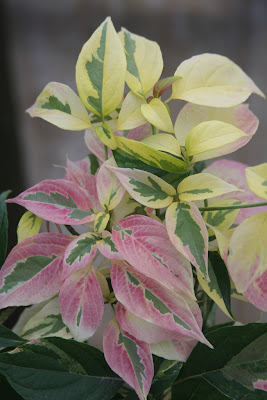 Today's blog is about variegated plants, those colorful trees and shrubs that add an exciting element to the garden, at least when sited thoughtfully. 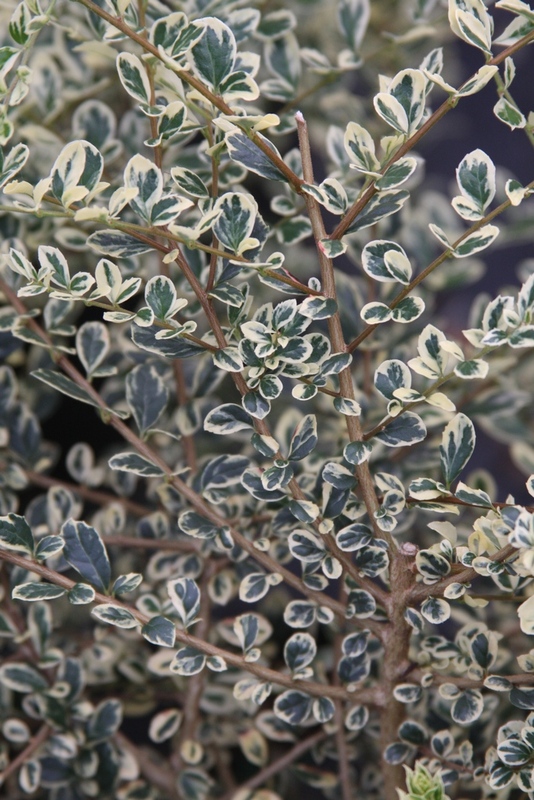 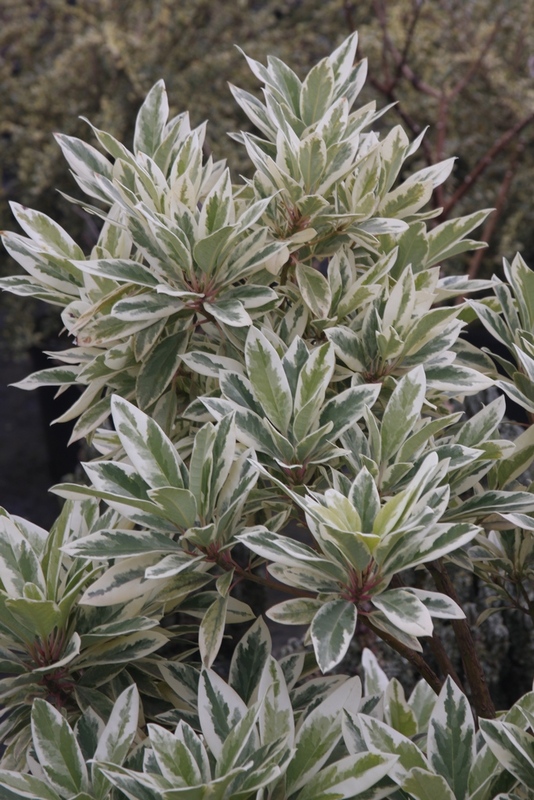 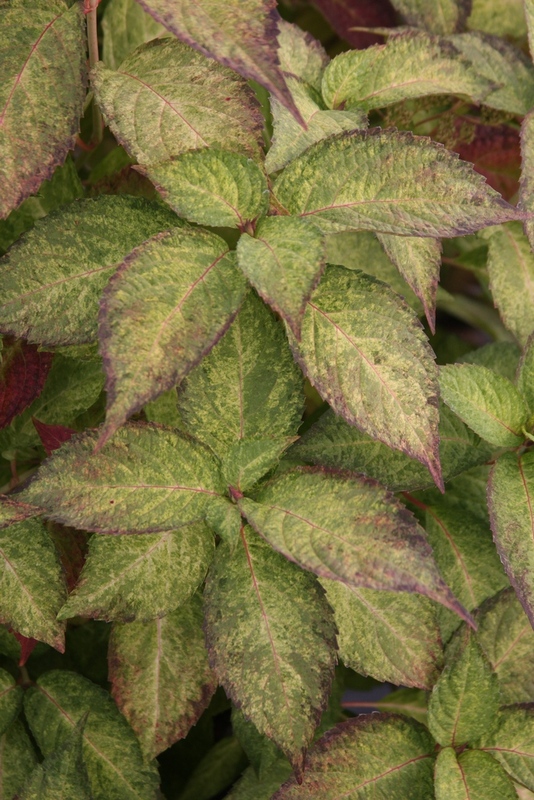 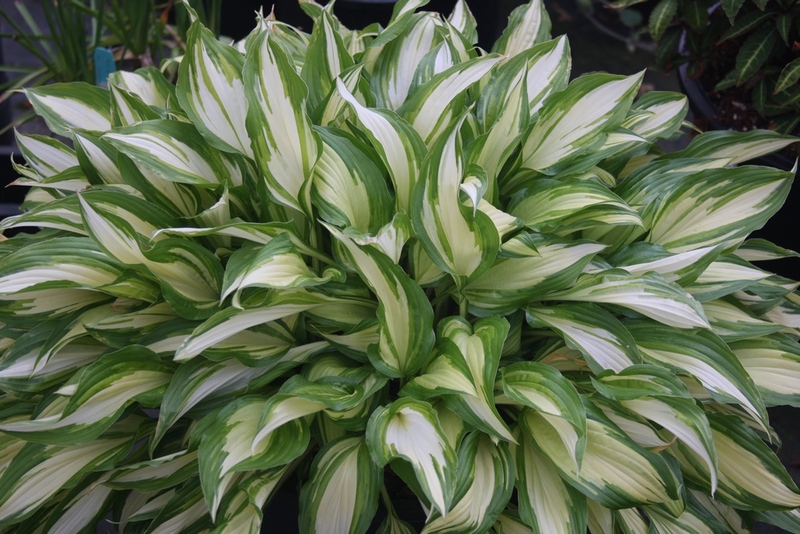 But first, the parameters please: just what defines a "variegated" plant? 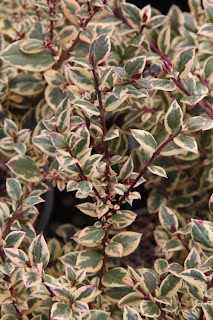 New growth on most plants, whether deciduous trees and shrubs or conifers, frequently has a different color than on the older foliage, but I wouldn't describe that as variegated. Also, new growth atop the tree, through exuberance, can vary from what is below. 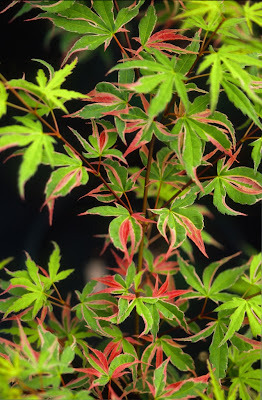 For Acer palmatum 'Ukigumo', which I would certainly call a variegated tree, and also Acer palmatum 'Alpenweiss', the first few years you might see no color at all, other than green. 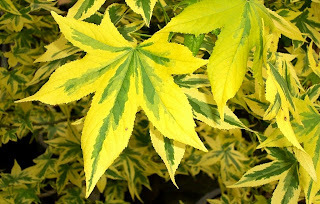 "Variegated," then, means that the bulk of the tree displays multi-colored foliage when it is established in a garden or container site, after it has settled down. 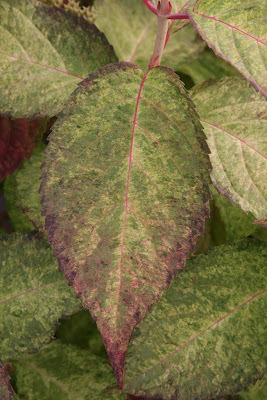 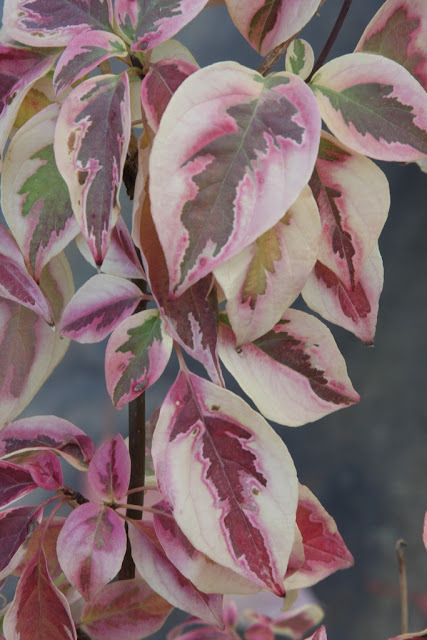 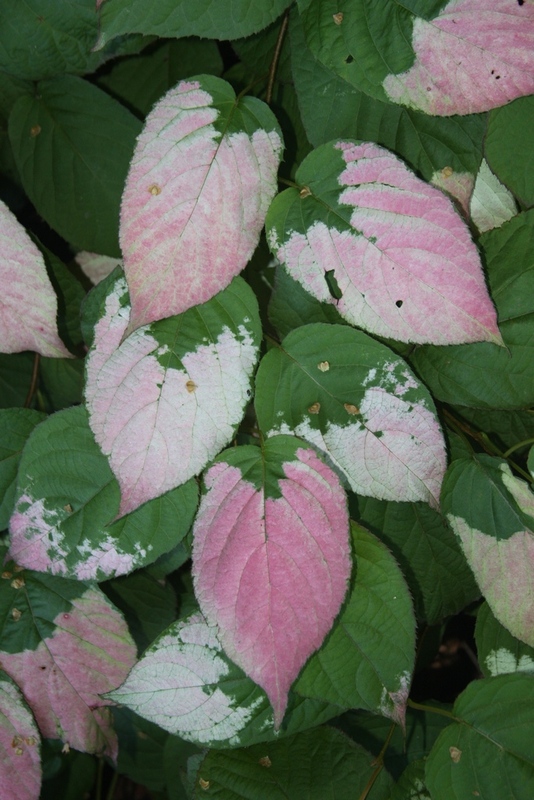 But also be wary of the "flash in the pan"-type of variegation, like a mutation of sorts that can have a twig or two of outstanding multicolored leaves. 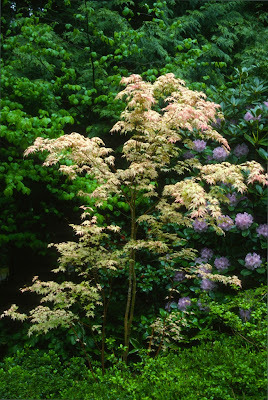 I've seen white and orange variegation on Acer palmatum 'Orange Dream', but by the next year it had disappeared. 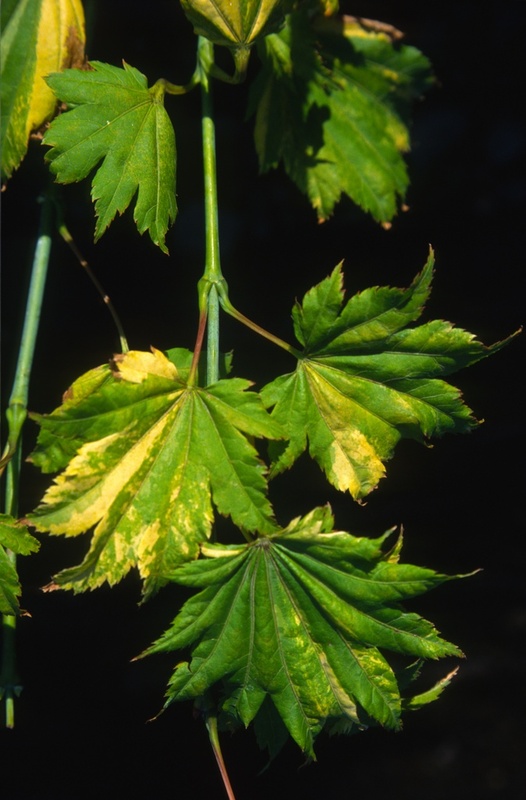 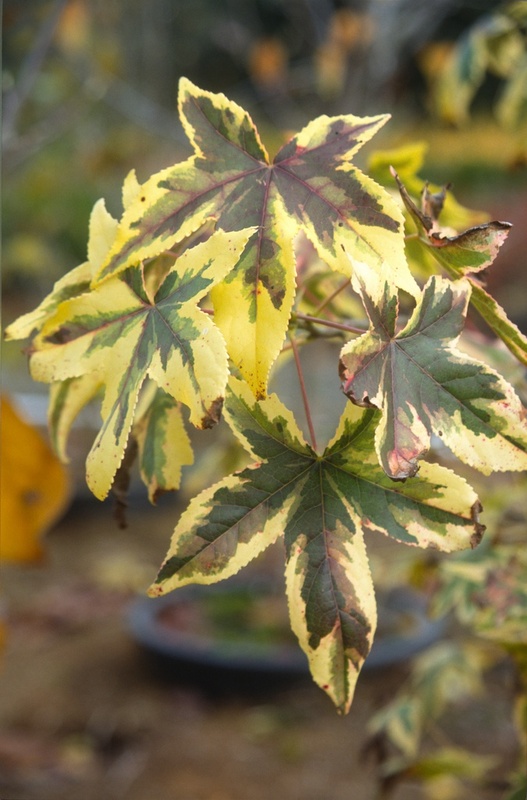 The same with Acer shirasawanum 'Aureum', which lasted for about eight years, but can be seen no more. 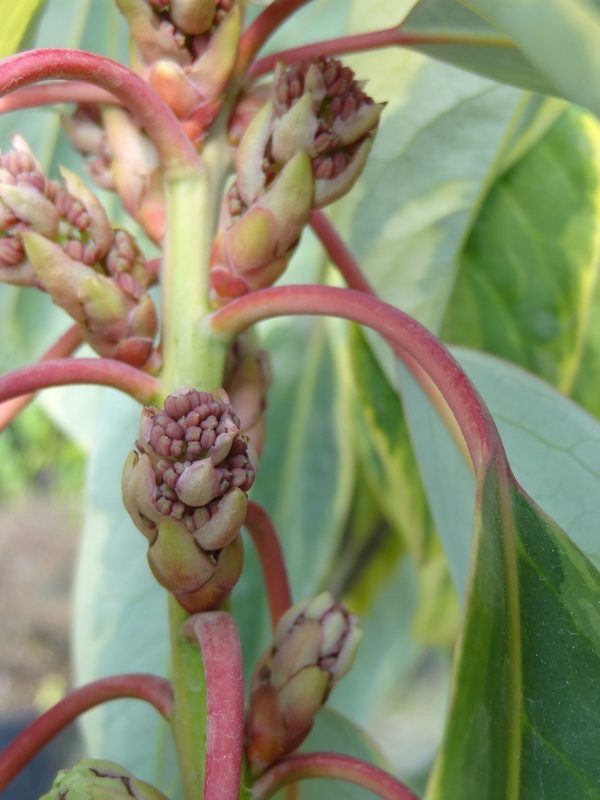 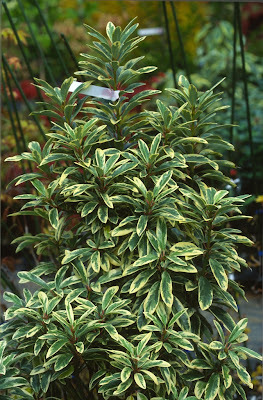 The 'Aureum' variegation was propagated and named 'Sonya Marie', but it is no longer in production due to unreliability. 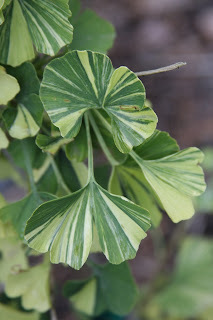 I grew Ginkgo biloba 'Variegata', and my oldest tree was once quite colorful. 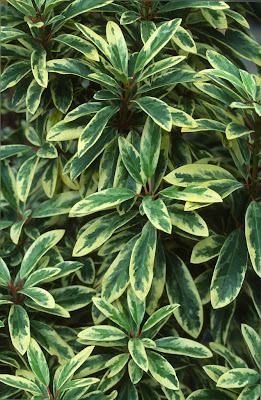 But the following year there was a significant reduction in variegation, and the following there was none at all. 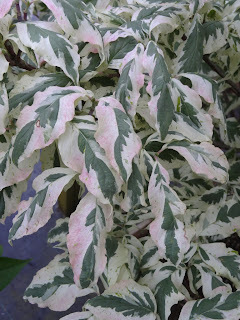 I waited for an additional five years, but still no variegation, so I gave up and just planted it at the bottom of the property, down by the creek. 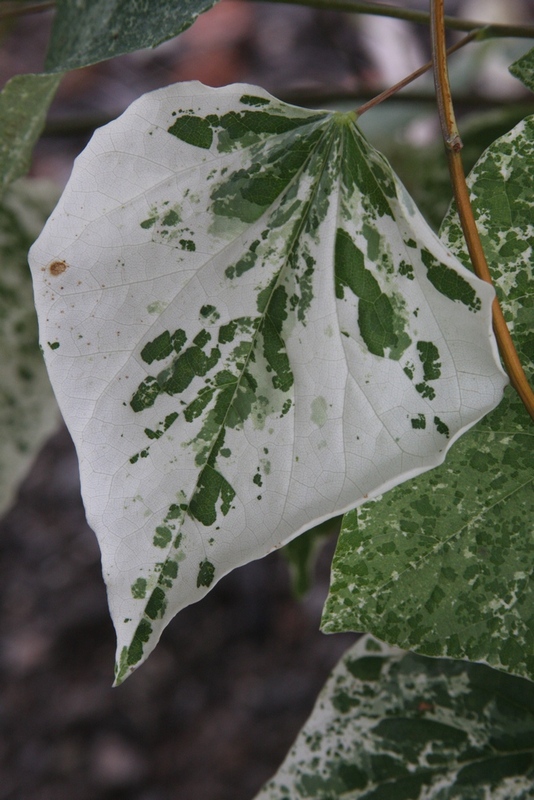 In those days I was more "intelligent" than now, and I proclaimed that "once the variegation is gone, it will never come back." 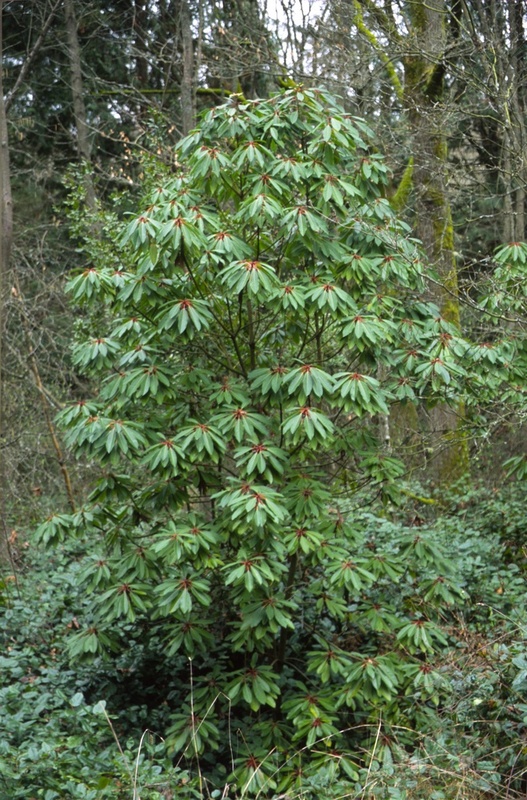 Except it did. Much later I noticed, one summer, that there was a single variegated leaf that sprouted from the trunk, and this was after ten years without. The following year there was more and last summer there were two branches filled with variegated leaves, while the rest of the tree was solid green. 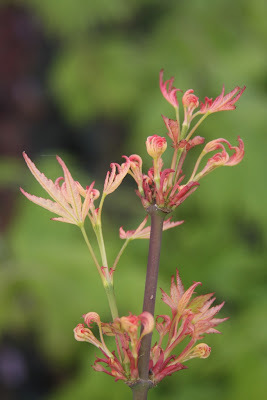 So there you go: plants have more quirks and surprises than you can imagine; they are less predictable and definable than you might wish, and old geezers like me are maybe a little more intelligent than the "young guns" of horticulture who think they have seen it all. 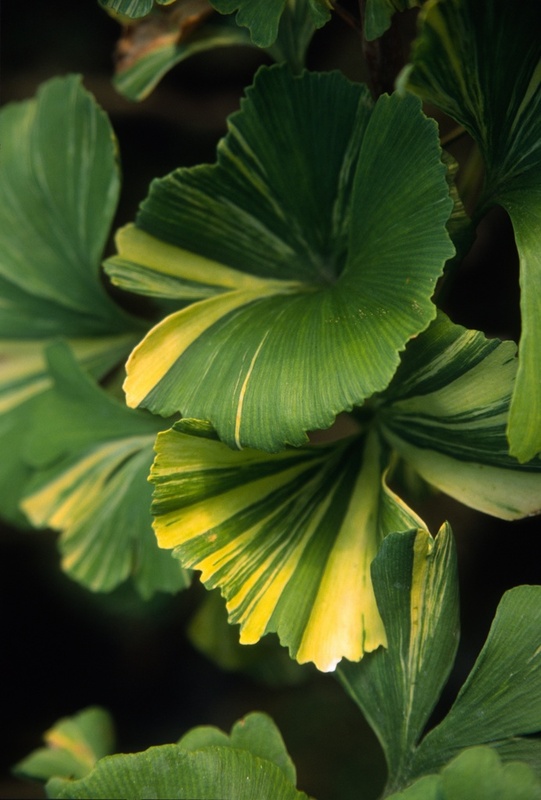 We grow other variegated Ginkgo clones, such as 'Majestic Butterfly' and 'Peve Maribo', but the same problems occur. 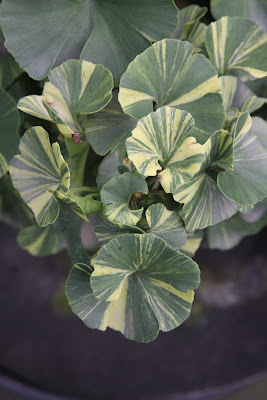 But, let me emphasize one important point, that the reverting issue could be my own fault, that the growing conditions at our nursery may not be conducive to keeping variegation intact. 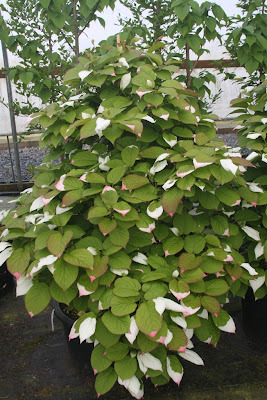 We are a rather lush nursery – No! 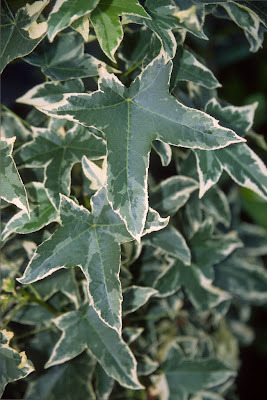 Not that way, we're usually sober – but lush in the sense that we could be pushing growth so much that the variegation can't keep up. I once saw an Acer palmatum 'Beni schichihenge' in a crappy nursery, in an undersized pot with leaves smaller than normal. 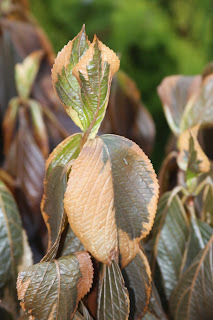 (The photo above is not it; that is what 'Beni schichihenge' normally looks like here.) 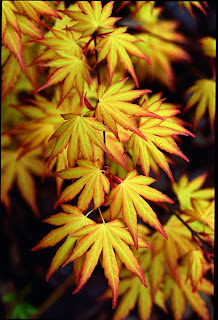 In El Crappo's Nursery, the orange in the leaf was very strong, a sight that could not be missed. 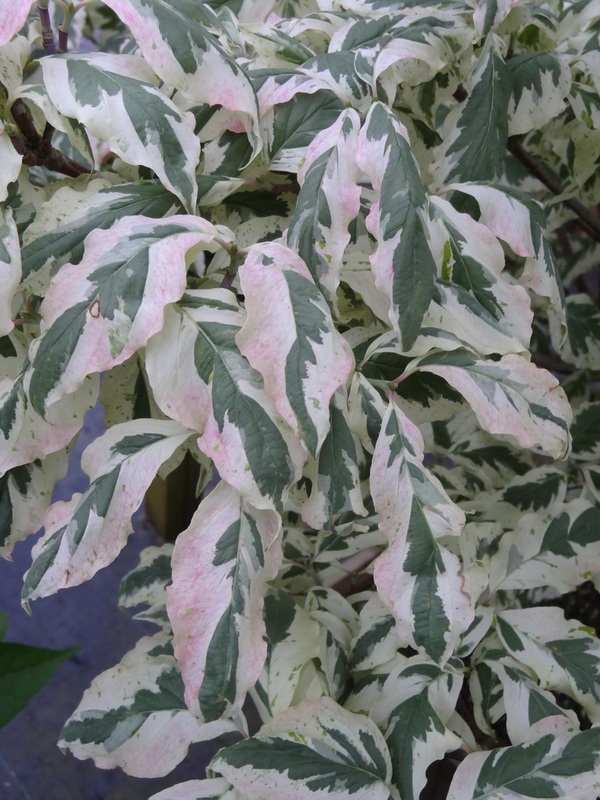 But enough of beating around the colored bushes, I'll simply mention some of my favorite, most dependable variegated trees and shrubs. 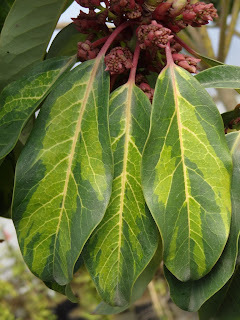 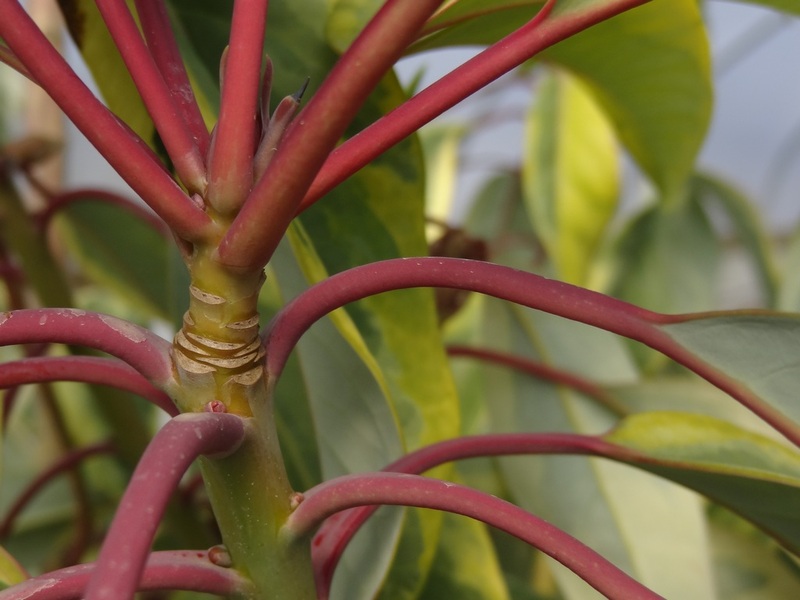 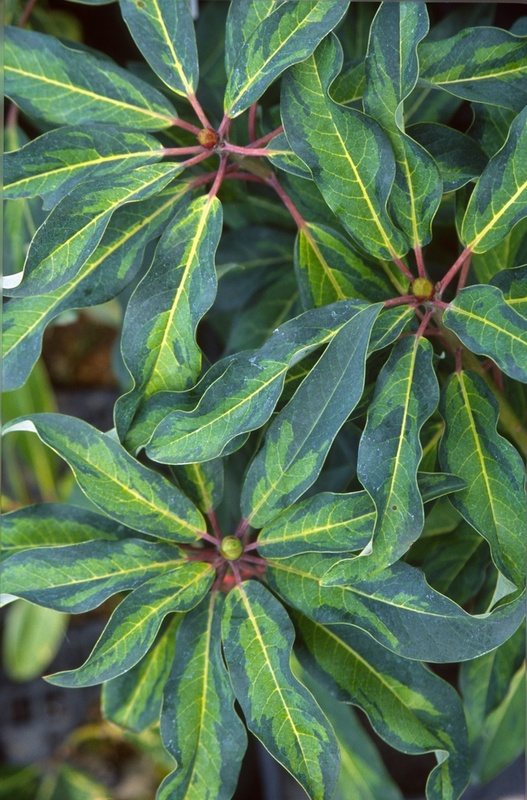 I like the genus Daphniphyllum, which resembles a Rhododendron, and which features evergreen leaves. 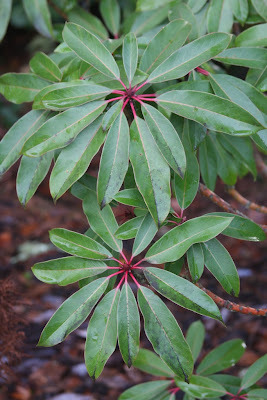 The flowers are not much, but still a Daphniphyllum – at least the species himalaense ssp. macropodum – adds an aristocratic element to the landscape, and is hardy to -10 degrees F, USDA zone 6. 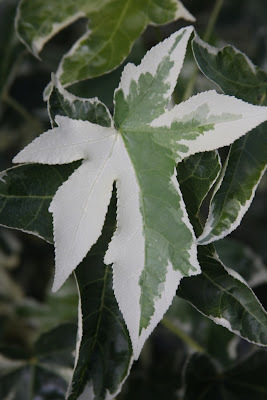 My starts of the variegated forms all came from Japan, but I have to admit that the nomenclature is suspect at best. 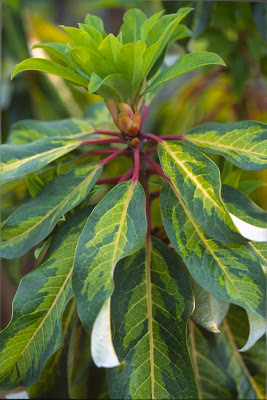 Daphniphyllum himalaense ssp. 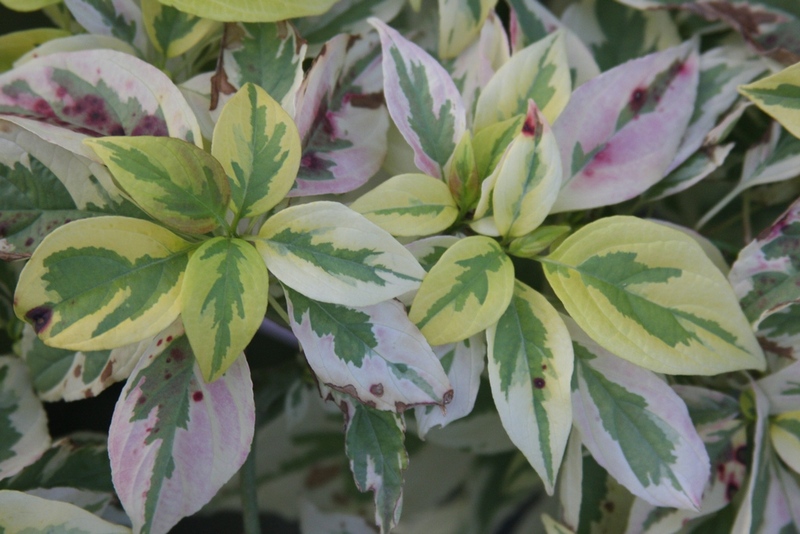 macropodum 'Variegated' looks to be slightly different than the cultivar 'Yellow-White', so we keep them separate. 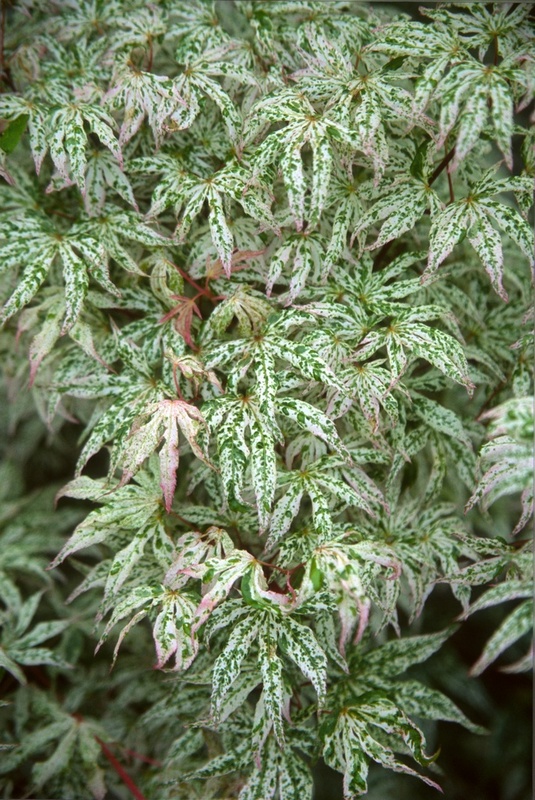 'Variegated Compact Form' – geez, how did these names get into Japan? 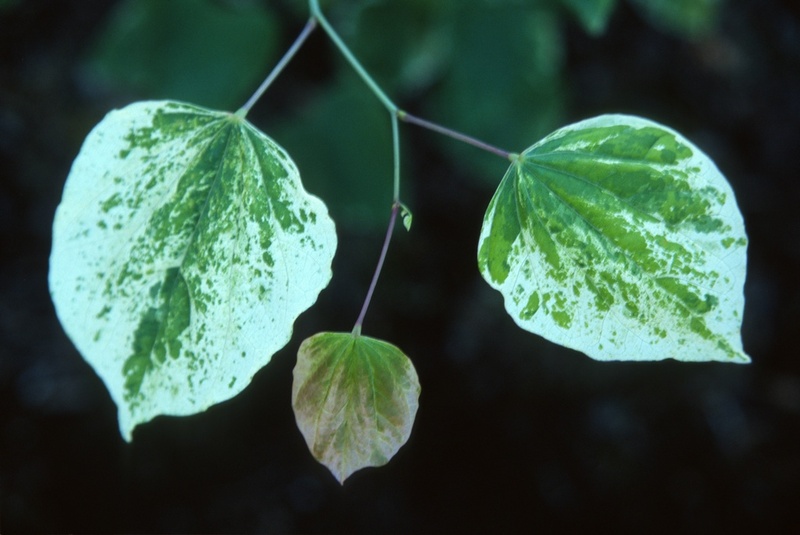 – does appear to be like one or both of the above, but with smaller leaves. 'White Margin' does not appear to be himalaense ssp. 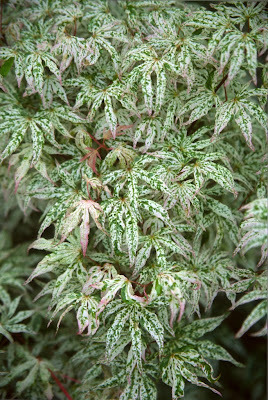 macropodum, but rather species teijsmannii, like our teijsmannii 'Variegated'. 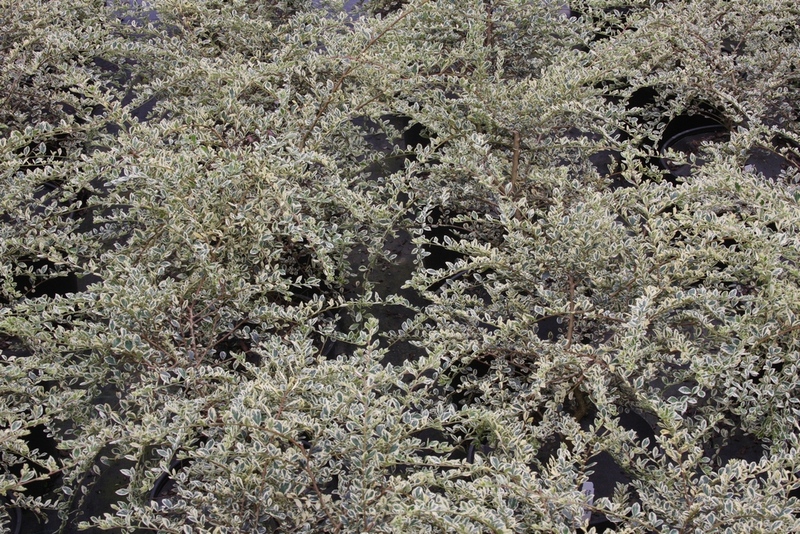 I'm hung up on correct nomenclature, but which does not help business at all. 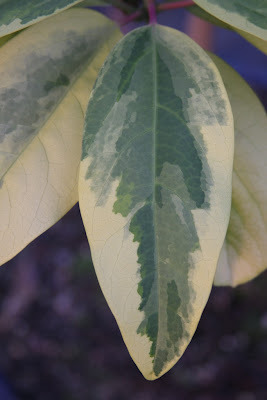 Maybe I should just renamed them to my liking, for won't Home Depot or Lowes eventually rescue my floundering nursery, discount the hell out of everything, and proscribe simple user-friendly names with butterflies smiling on the picture labels? 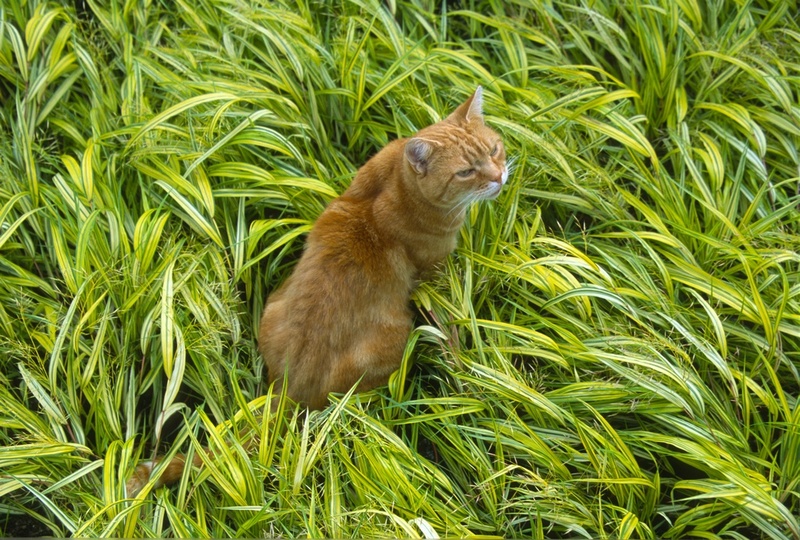 Why should I get so carried away with accuracy and integrity? 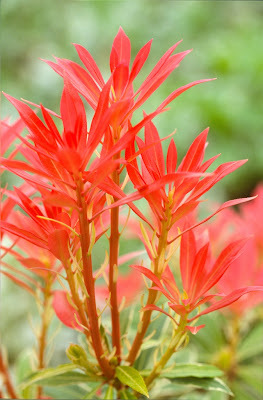 In conclusion, I admit that I don't really know the correct ID. 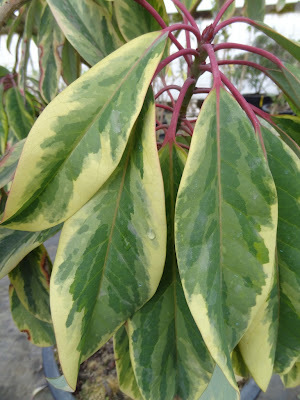 Great plants though. 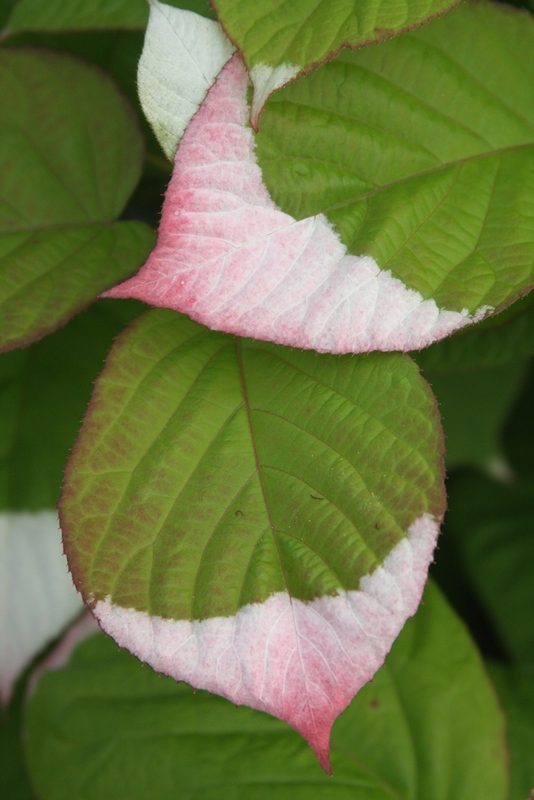 Consider the variegated "Kiwi," Actinidia kolomikta, a green-leaved deciduous vine that's spectacularly splashed with pink and white. The colors are preposterous; "nature can't do that, but look at me!," the plant exclaims. This Kiwi is best sited in a woodland setting, out of full sun. 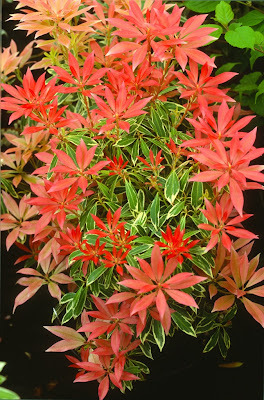 There is no fall color to speak of, as A. kolomikta exerts all of its creative energy in spring. A. kolomikta is hardy to -30 degrees F, USDA zone 4, and comes from Russia, China, Korea and Japan in temperate mixed forests. It is not grown for its fruits, although it will bear if a pollinator is present, but merely for its ornamental foliage. 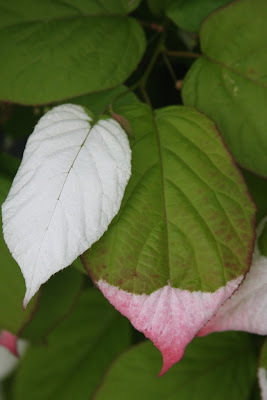 The commercially grown Kiwi you see in the market is the "Fuzzy Kiwifruit," Actinidia deliciosa, which comes from southern China and is considered the National Fruit of China. 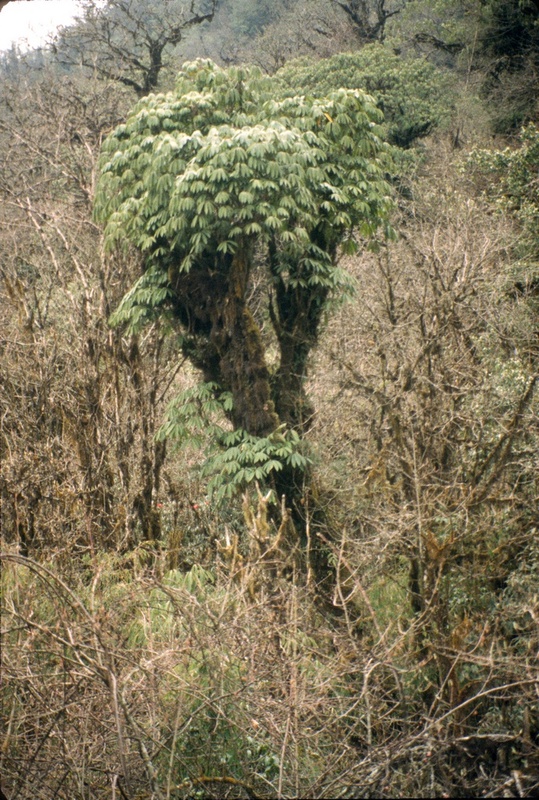 Seeds were introduced to New Zealand when a principal of a girl's college had been visiting mission schools in China. The name "Kiwi" developed because of similarity with New Zealand's national symbol, the Kiwi bird, as both are small, brown and furry. 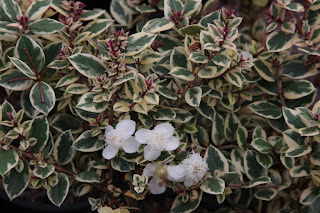 Though I have grown them for years, two plants give me the fits to identify when I see them in the nursery: Azara microphylla 'Variegata' and Luma apiculata 'Glanleam Gold'. 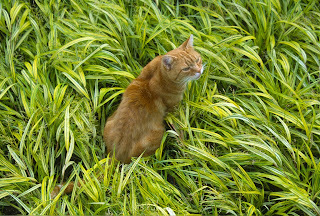 I always have to check the label to know which one I am looking at. 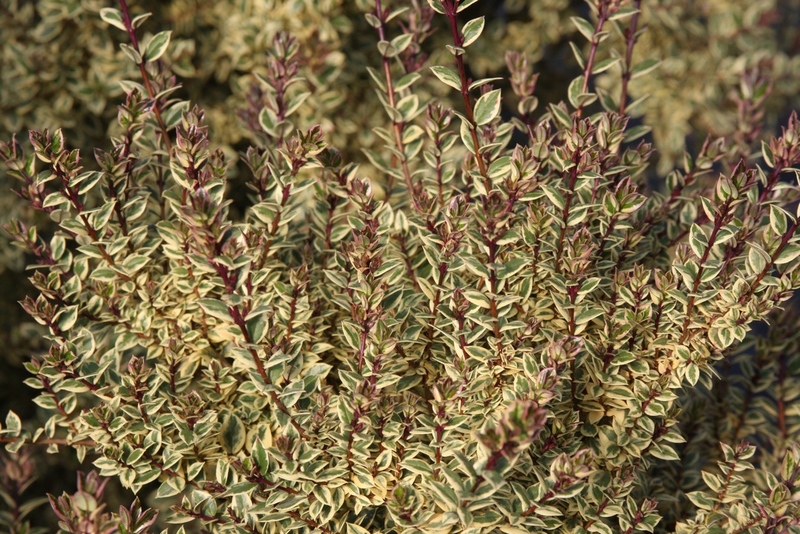 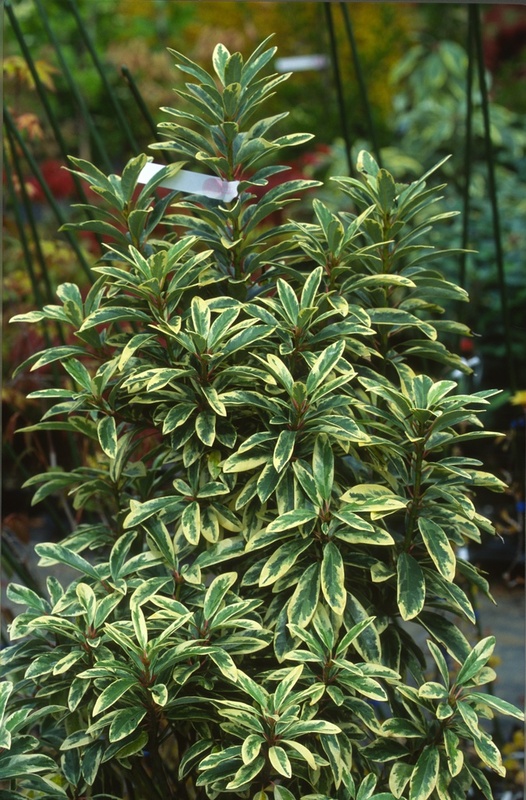 'Glanleam Gold' is a variegated "Chilean Myrtle" with tiny evergreen leaves, and it never takes a winter's time-out. 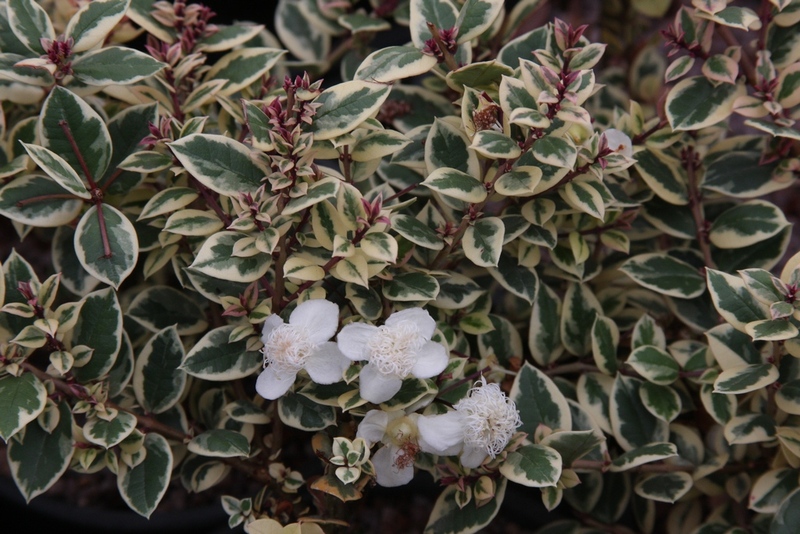 In spring the gardener is rewarded with small white flowers. 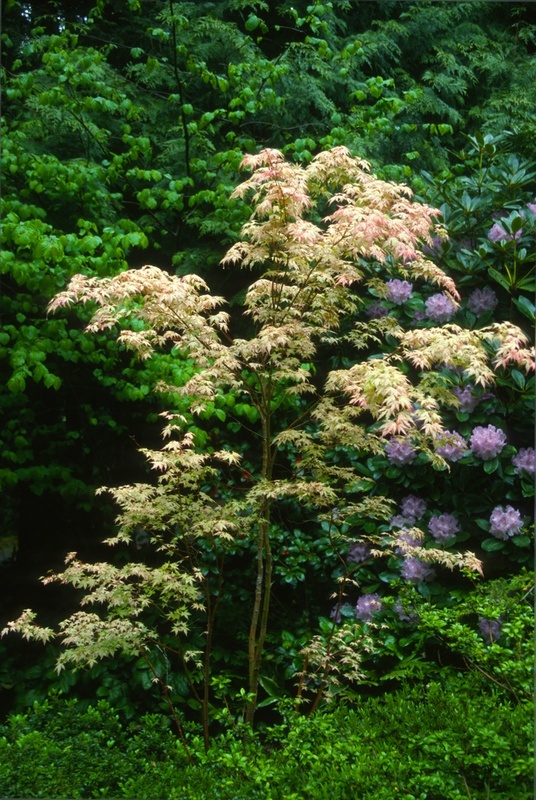 Dense hedges can be formed from 'Glanleam Gold', or it can be grown as a single specimen tree. 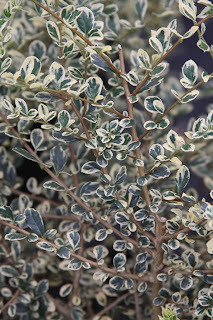 Azara microphylla, the "Box Leaf Azara," is also from Chile and Argentina, and 'Variegata' is evergreen too. 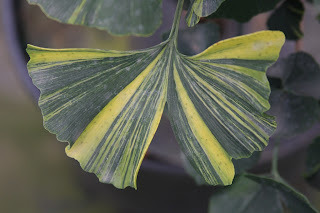 This month our plants are adorned with numerous tiny yellow flowers with the scent of vanilla It is slightly more winter-hardy than the Luma, as Azara is listed to USDA zone 7, or 0 degrees F.
A variegated form of "Redbud" is Cercis canadensis 'Silver Cloud'. 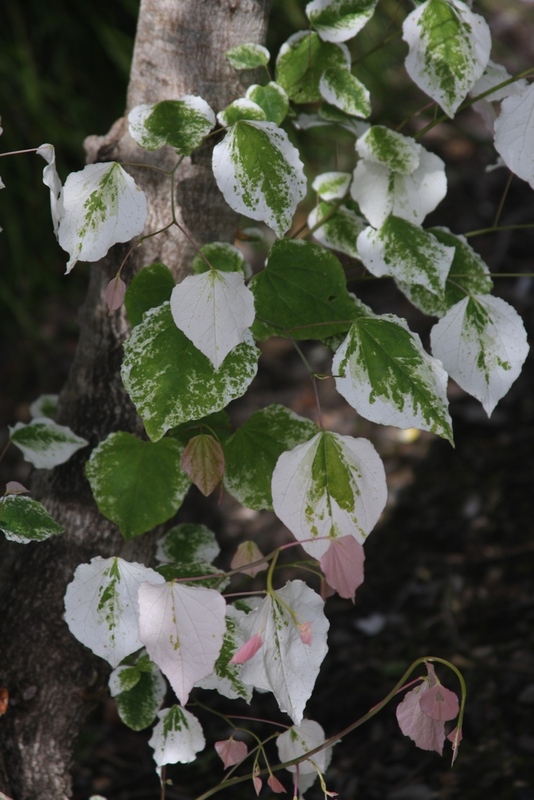 Its circular (cercis) leaves are green with various amounts of white mixed in. 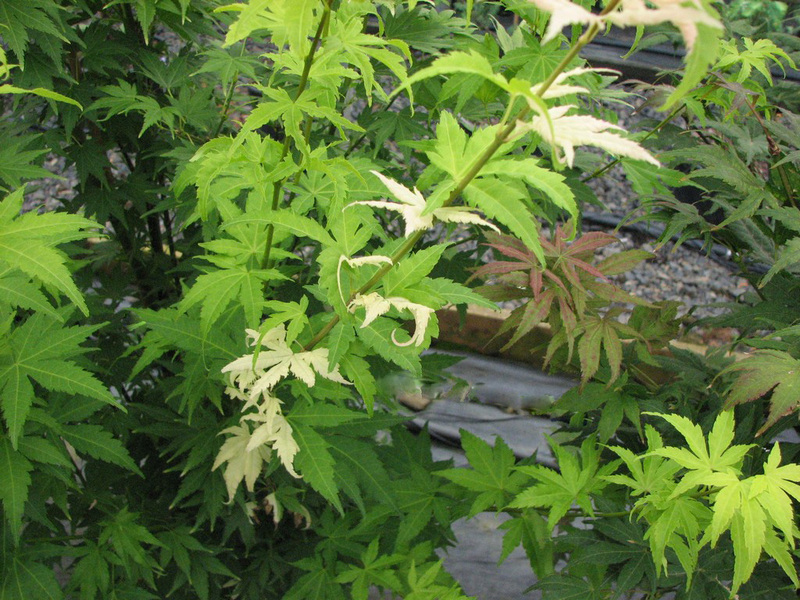 More white is present in spring, but fortunately the green increases in summer, so that the foliage does not burn when established and given adequate moisture; but still, some PM shade is beneficial. We graft this cultivar to decent success, and I presume that others do too, so I can't explain why it remains rare in the trade. The only cultivar of Cornus florida we grow is 'Welchii', I think also known as 'Tricolor'. 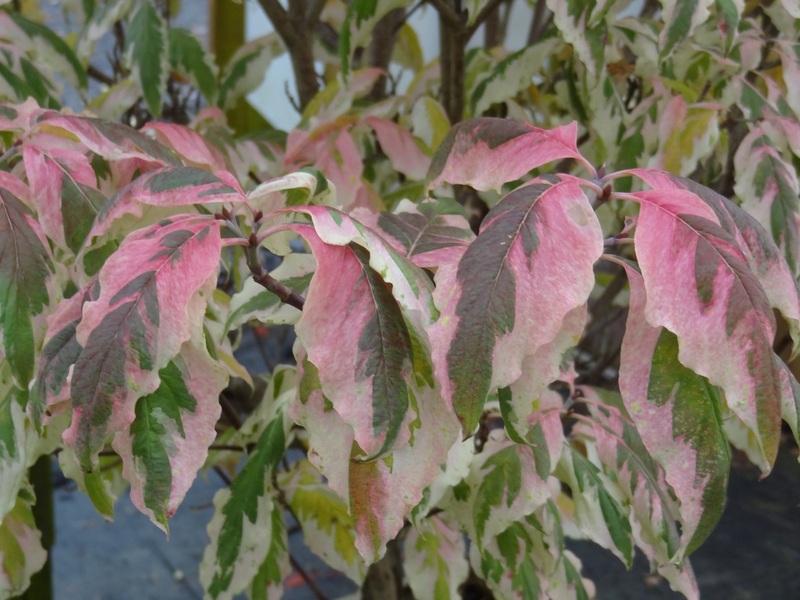 The reason is that we prefer Cornus kousa cultivars, as they are not as affected by the devastating anthracnose disease which can afflict floridas in many parts of the country. But 'Welchii' is a beauty, and takes no second stage to other "dogwood" cultivars of various species. As you can surmise from the photos above, 'Welchii' is best sited with afternoon shade. 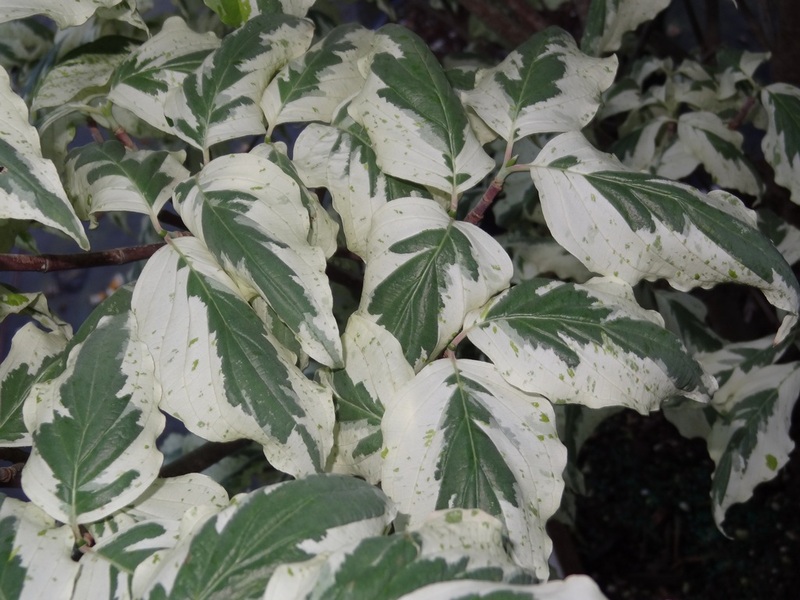 Cornus sericea 'Hedgerows Gold' is a vigorous green-and-white variegated selection, named and introduced by David Mason of Hedgerows Nursery in Oregon. 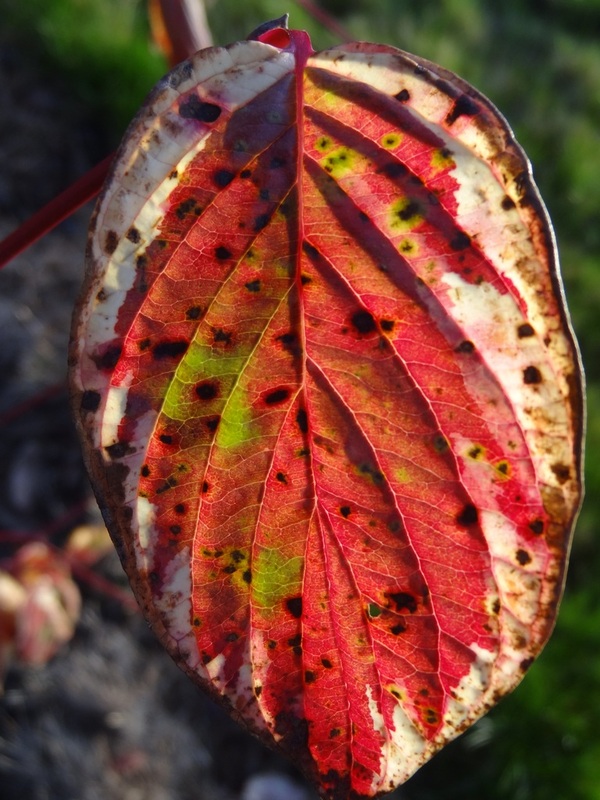 I don't have a spring or summer photo, but you can see how dramatic it becomes in autumn. 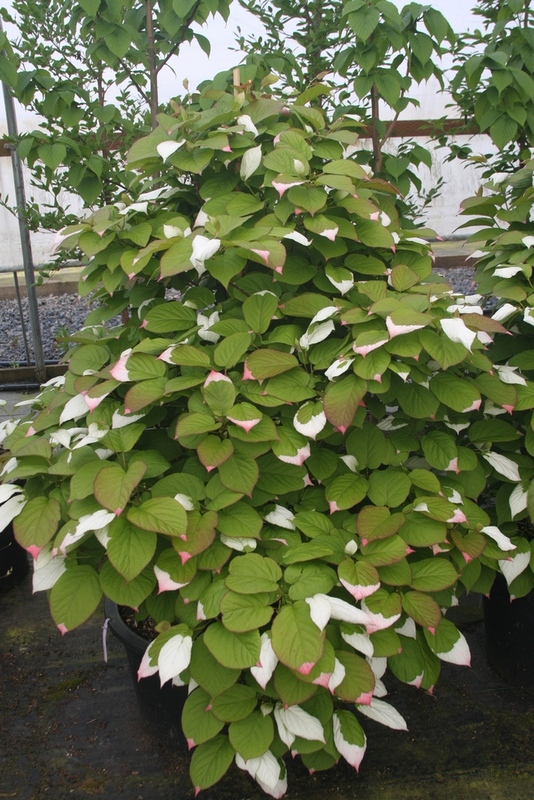 Cornus sericea is synonymous with stolonifera, and is commonly known as the "Osier Dogwood." 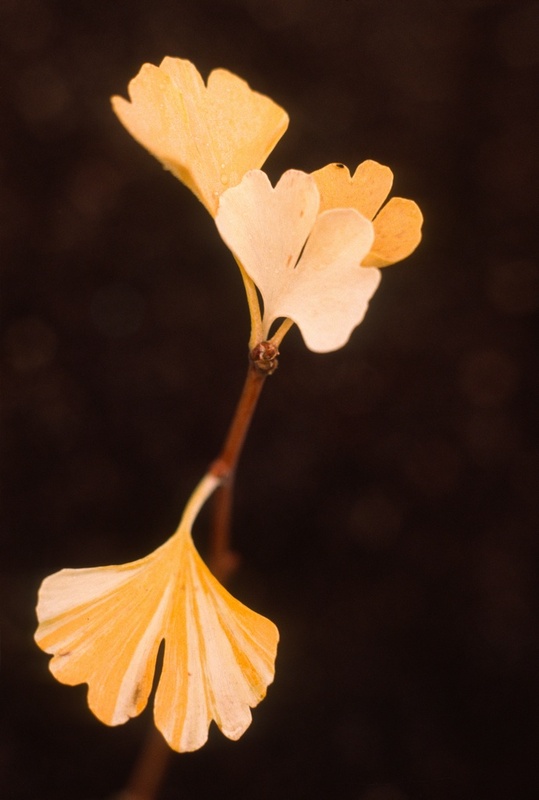 The species is a brushy spreader native to northern and western North America. I really tried to leave out the myriad of variegated cultivars in the species Cornus kousa, alternifolia and controversa, for I have bragged about them innumerable times. But indulge me just one, as it is my very favorite: Cornus alternifolia 'Saya', commonly known as "Saya Pagoda Dogwood." This was named after my half-Japanese daughter, whose name translates as "a field of flowers." Our 'Saya' introduction looks like a field of flowers as well, I think. 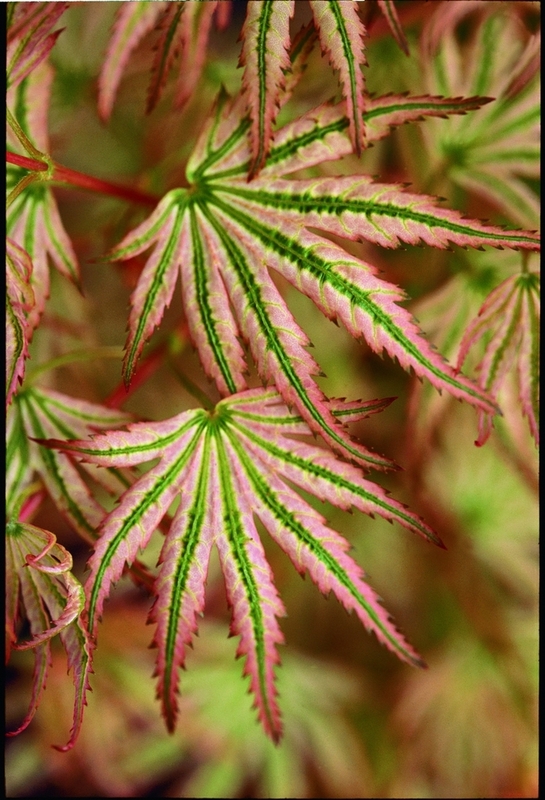 The photo of the autumn leaves, most immediately above, is the most delicious coloration of any plant photo that I have ever taken. 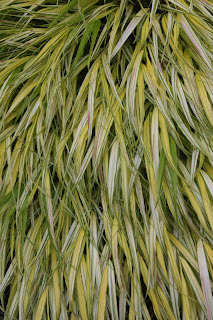 Hakonechloa macra 'Aureola' is a golden-variegated selection of "Japanese Forest Grass." 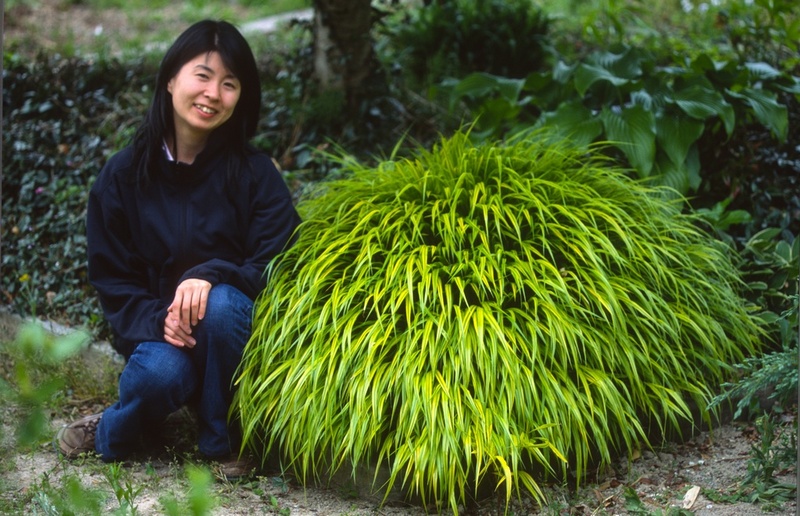 It is a perennial grass that forms a waving, arching mound, and is perfect in a shady woodland garden. It is a clumper, and only spreads slowly. 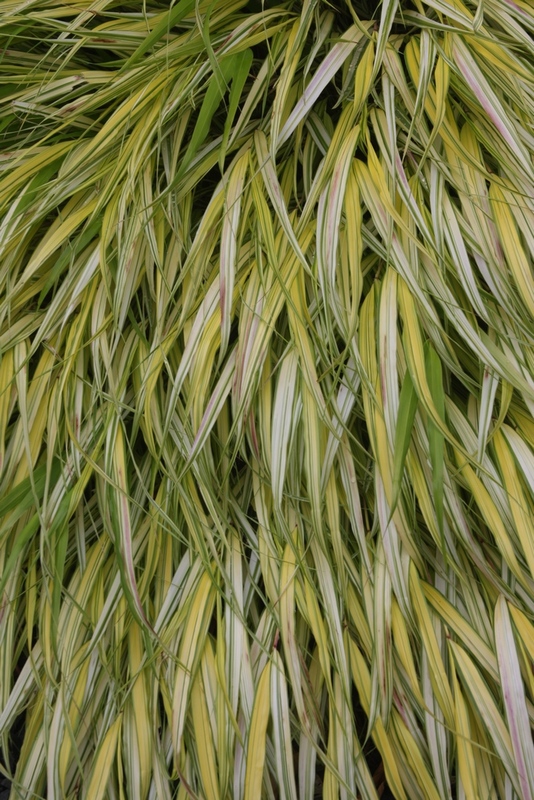 I have regretted planting many grasses and bamboos over the years, but 'Aureola' is a welcome exception. 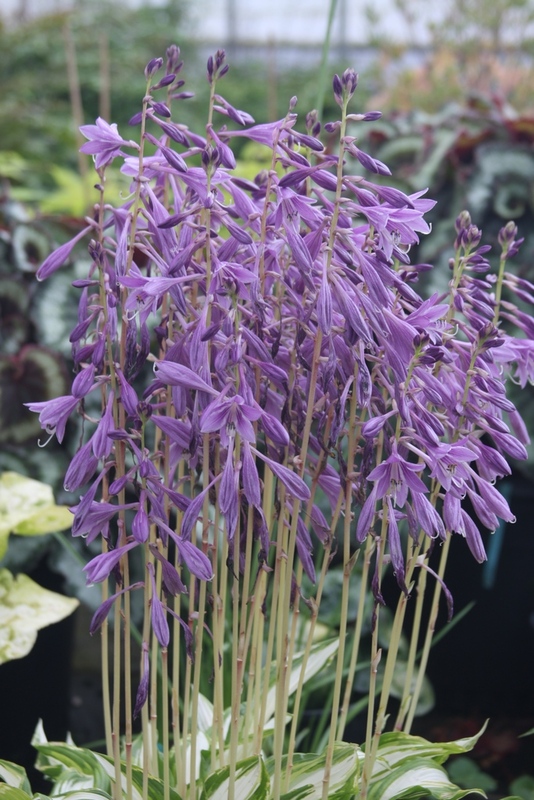 If you have woodland room for the Hakone grass, you can also think about planting from dozens of Hosta choices. I like 'Medusa', even though I'm not a Hosta aficionado. 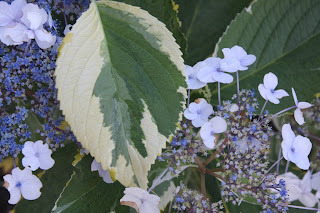 We haven't propagated Hydrangeas for the past few years, as they are grown by the millions by everyone else. 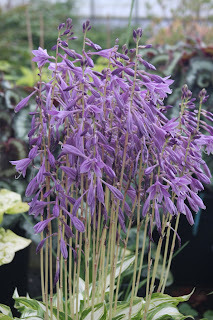 Still, visitors comment on the beauty of the following two, and I seldom see them marketed elsewhere. Hydrangea macrophylla 'Oamacha Variegated' is a variegated version of the better-known 'Oamacha', a lacecap of Japanese origin. 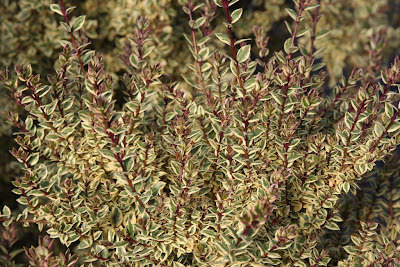 It is sometimes listed as var. oamacha, which I don't think is proper, and sometimes as 'Oamacha nishiki', which would certainly be more valid than 'Oamacha Variegated'. But I keep the latter name, for that is how I received it from Japan, although my source might have just been helping me with translation. Hydrangea macrophylla f. normalis 'Quadricolor' is a larger and, frankly, more gaudy lacecap than the 'Oamacha' selection. 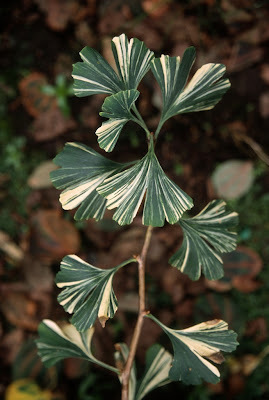 Colorful leaves feature dark green, lime green, yellow and cream-white; and each leaf can display various amounts of the colors above. 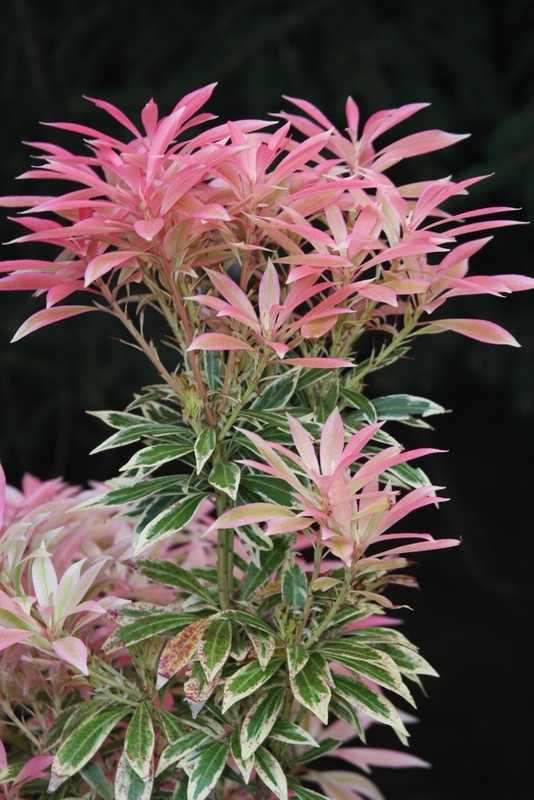 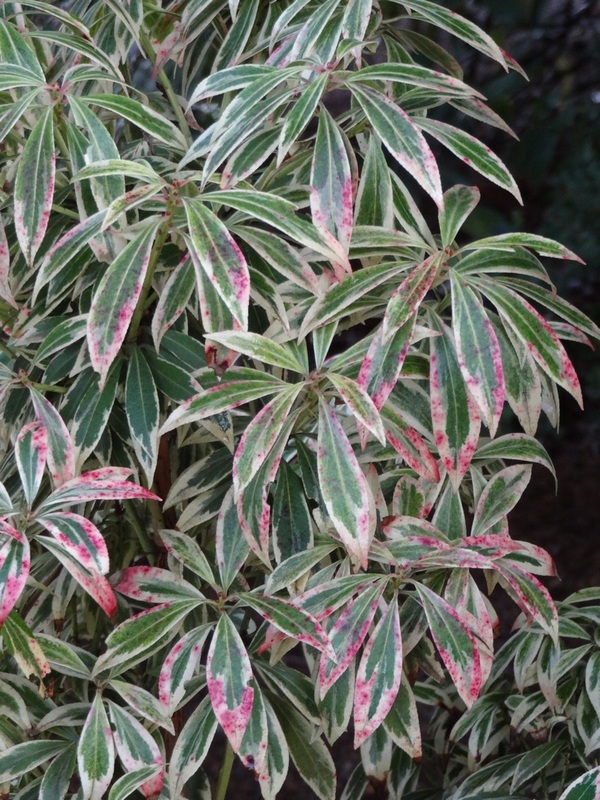 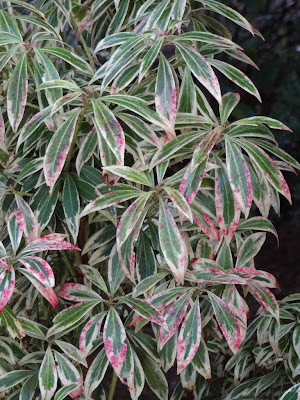 Pieris japonica 'Flaming Silver' was named in reference to its red new growth in spring, as well as the green evergreen leaves which are edged in cream white. The variegated leaves alone would not command much attention – many plants feature prettier patterns – but the "flaming" aspect is most dramatic, especially with glowing backlight. 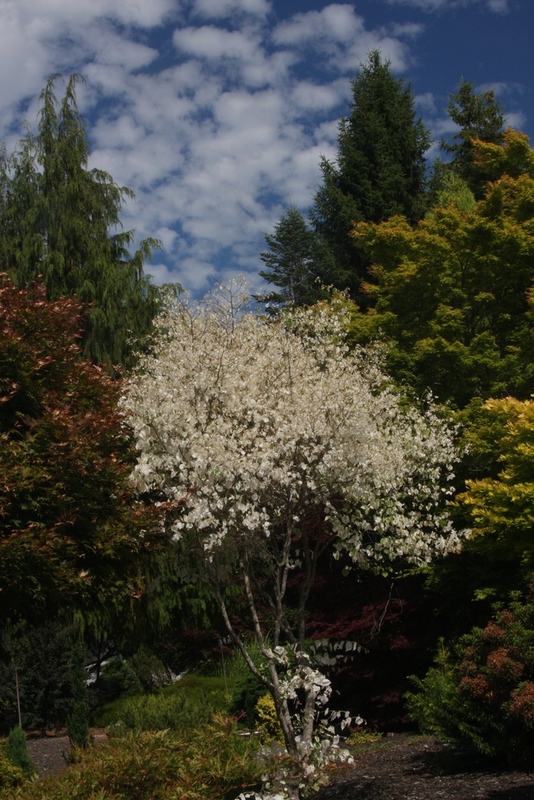 Blossoms in spring are white, but they do not add much to the overall presentation either. We have collected over twenty cultivars of Pieris, and I obviously like them all (or I would dump them), but I doubt that any other provides more "bang for the buck" than 'Flaming Silver'. 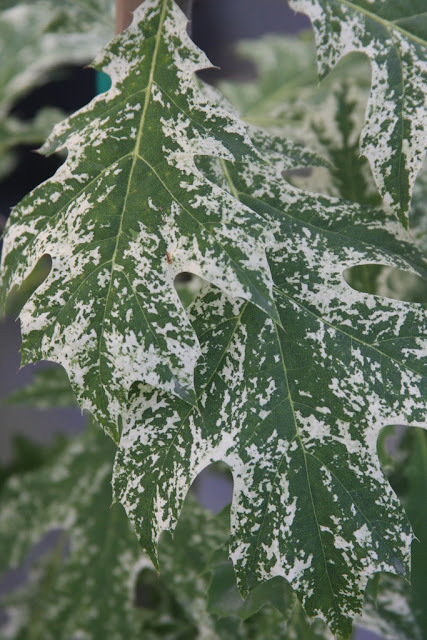 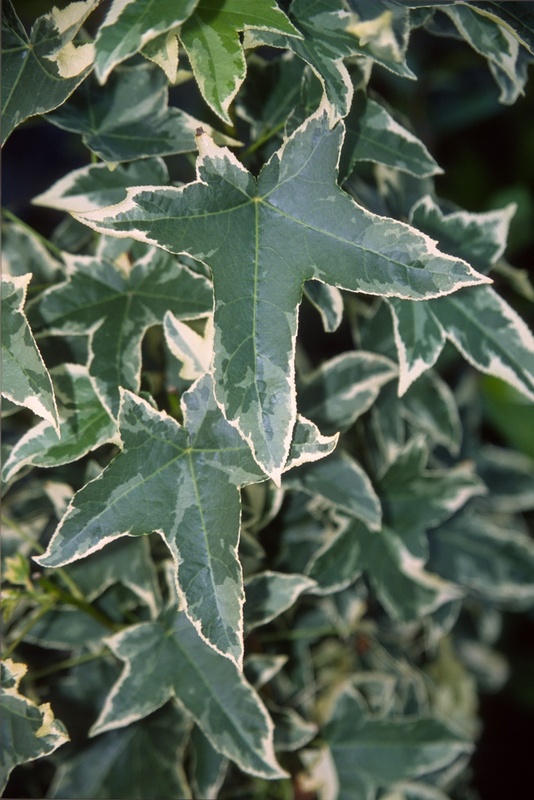 There could have been other variegated choices, such as liquidambar styraciflua 'Silver King' and 'Golden Treasure'. 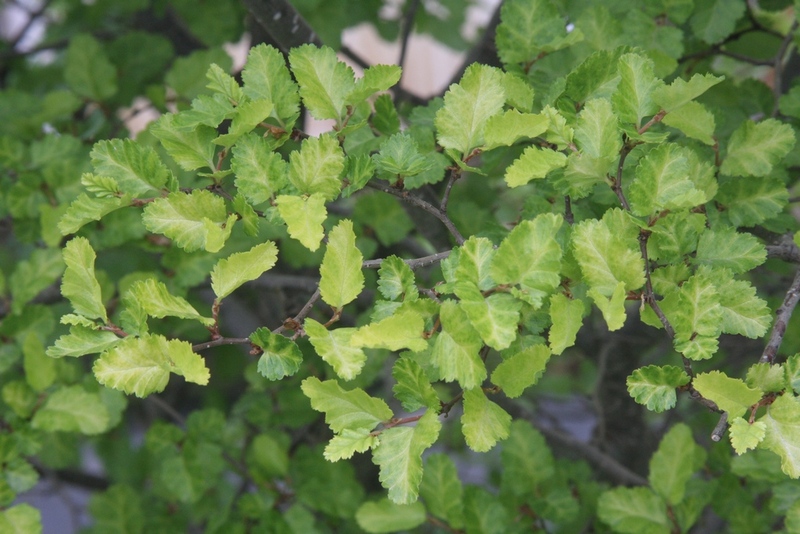 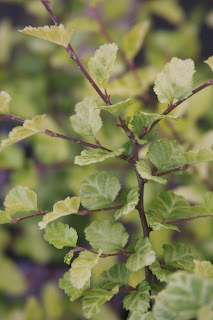 Nothofagus antarctica 'Chillan' has subtle variegations of cream-white and cream-yellow, depending on the time of year. And a new oak with splashes of color, a Quercus rubra, with no official name, but one we temporarily call 'Greg's Variegated'. 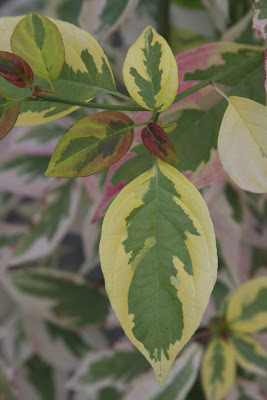 I imagine every genera and every species has produced something with variegation at some point in time. 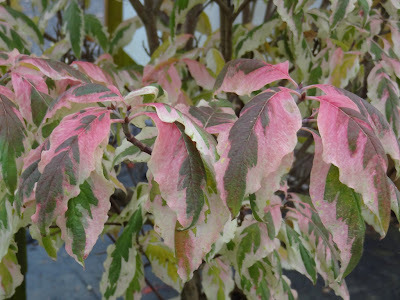 So, there you have some bushes and trees with multi-colored leaves. 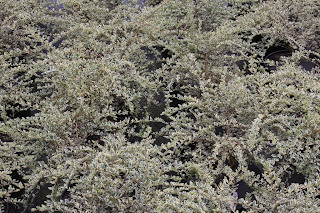 You will notice that there were no conifers in the group, but they will perhaps be the focus of a future blog. 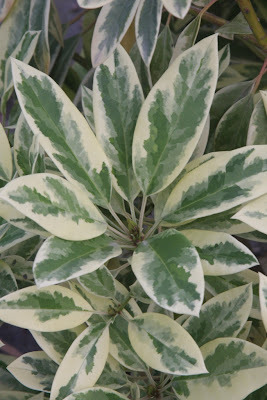 My final advice about variegated plants in the landscape is to use them sparingly. Like exclamation points in writing, overuse can reduce their effect.